As fog computing takes hold for IoT data processing, standardization becomes necessary. The growth of the Internet of Things (IoT) has stimulated the development of computing at the network edge working in concert with centralized processing centers such as the cloud. The number of IoT endpoints can be enormous. The cost of connecting a large number of endpoints can also be very high. IoT devices will be producing massive amounts of data, much of which should not be traversing the network. The raw data should be processed locally, with the important data sent to data centers and cloud service providers. Fog computing, also known as fog networking, is a decentralized computing infrastructure with data processing at the edge of the network. What this means is that no single vendor or provider can offer a complete solution. Therefore standardization is necessary so that all the components can connect, communicate, and be managed. 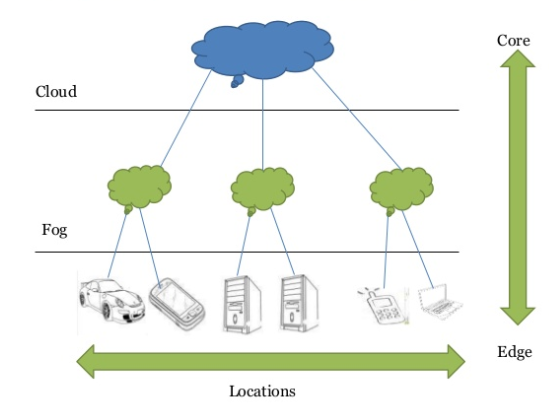 Fog computing resources and application services are distributed in a logical, efficient location near the connection from the data source (endpoint) to the cloud/data center. Fog computing processes data locally and then uses the network to communicate with other resources for further processing and analysis. A worthwhile reference, published by Cisco, is, "Fog Computing and the Internet of Things: Extend the Cloud to Where the Things Are." A fog framework, shown in the diagram below, provides an intermediate processing point between the IoT endpoint and the cloud. The edge/fog device can act at as a controller for connecting multiple IoT endpoints to a network. The controller can act like a multiplexer, or gateway, aggregating the data traffic. With today's processing capabilities, it's easy to process data in the edge device and send the results to a central location for final processing and analyses. The fog systems are programmable with software that can be modified, and containing user applications, maintenance functions, and network management. The edge device can be embedded within a vehicle, for example, or multiple edge devices could be embedded in a dam or a building. By adding edge processing devices, the cost of the IoT endpoints can be reduced, with the intelligence residing in the edge device. This can also improve security by reducing the cost and complexity of the IoT devices. Sending the analyzed and processed data up to the cloud makes better use of the cloud services and will keep the traffic level to and from the cloud more manageable. The IEEE 1934 standard was largely developed by multiple groups over the past two years, including ARM, Cisco, Dell, Intel, Microsoft, and Princeton University. The standard aims to prescribe an open architecture for distributing computing and networking functions closer to users, "along a cloud-to-thing continuum of communicating, computing, sensing and actuating entities," the IEEE Standards Association says. The development of the standard is important for telcos as well as component and software vendors as they prepare for new applications and services, especially with the advent of 5G services. The possible services make use of edge facilities to lower latency, a must for fast response (millisecond) environments. Fog computing will also be a staging area to consolidate and filter IoT data transported over the network. The flood of IoT data is expected to clog the network if all of the data is required to make the journey to the cloud.